A close examination of the beetles will reveal that their prominent black antennae bisect their compound eyes creating two sets of eyes with one set located above the antennae and one set below. The genus and specific epithet of the beetle describes this unusual feature; both are derived from the Latin for "four eyes." The adults feed on milkweed leaves and the larvae bore into the roots and stems. 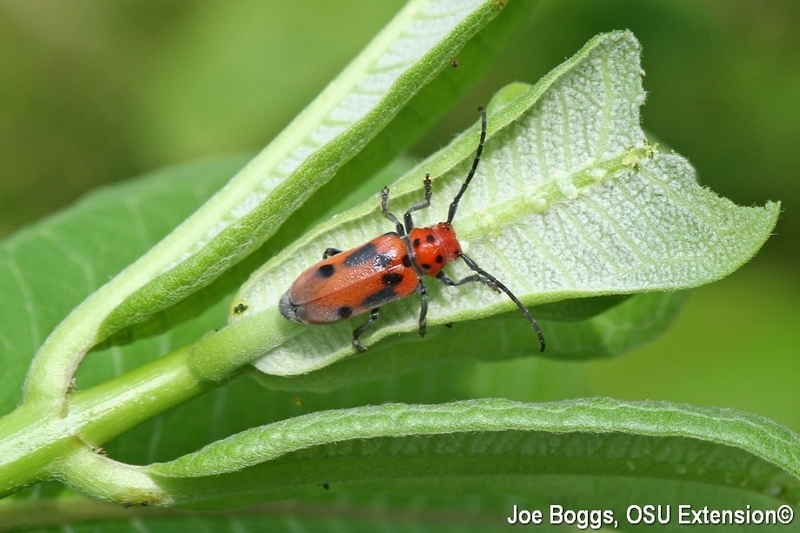 Red milkweed beetles seek protection from predators by accumulating in their flesh the alkaloid toxins, called cardiac glycosides (cardenolides), which are concentrated in the milkweed's sap. This is the same chemical defense strategy practiced by other milkweed eaters such as Monarch Butterfly (Danaus plexippus) caterpillars; Milkweed Tussuck Moth (Euchaetes egle) caterpillars; Large Milkweed Bugs (Oncopeltus fasciatus); and Small Eastern Milkweed Bugs (Lygaeus kalmii). Indeed, over 50 different taxonomic groups of milkweed-herbivorous insects accumulate milkweed toxins. As with milkweed beetles, all of these members of the milkweed menagerie advertise their toxic character through splashy coloration, usually involving an orange on black motif; an interesting twist to the old axiom that "you are what you eat."